Chances are, at some point in your life, you’ve seen a handball court. In fact, you’ve probably been a handball player a time or two. Anyone who can recall a childhood recess or after-school hours spent on the playground, whipping a ball against a wall between friends has, in essence, played the sport. There are many accounts of how handball may have originated. From early Egyptian and Roman records as far back as 2000 B.C., to the codification of the modern day, team sport version in 19th-century Germany and Scandinavia, one thing is clear: it’s a pastime enjoyed by many cultures. Ireland stakes particular claim, where it was once played against the walls of ancient castles and monasteries. Handball courts provided an activity for laborers, and when daytime play was done, these same courts – many of which still reside in the Irish countryside – were used for celebrations and dances at night. In later centuries, the game was popular as much for its value as a sport and entertainment, as its social aspect. Following matches, players often came together to dine and drink at their local pub, and Irish immigrants would carry that camaraderie, along with the game, to America in the 1800s. The first court in the U.S. was built in San Francisco during the gold rush, attached to the alleyway of a bar, and the game was favored initially by the city’s Irish and Jewish immigrants. It soon took up a following in New York where one-wall handball was the variation of choice, and during The Great Depression, it provided cheap or free entertainment. As the sport’s popularity spread in the ‘20s, tens of thousands of hand ball courts were erected, most of which consisted of three walls and were in schools and parks. They became anchors of community, with neighborhoods growing up around them. The courts were considered a place of refuge during tumultuous times. Courts were also cropping up in Los Angeles, where the Los Angeles Athletic Club saw a spike in interest among members. In the 1930s, LAAC handball enthusiasts included Club champion Ernie Clark and actor Harold Lloyd (in fact, Lloyd was such an avid player, he kept his own courts behind a false wall at his Beverly Hills estate and studio). The sport was growing in popularity, and even had a national championship tournament, but still lacked funding and real organization. In 1951, an enthusiast named Robert W. Kendler created the U.S. Handball Association to help address those issues. He standardized court sizes and raised money to fund tournaments. As his efforts took hold and major players like Jimmy Jacobs started to gain notoriety, the sport grew. In 1954, new regulation handball courts were built at LAAC. They were the first on the Pacific Coast to provide a glass sidewall spectator gallery and a back wall window for photo and television purposes. The nation’s four-wall handball championships were held at The Club in 1955 and 1959, and for the first time in the history of the sport, both tournaments were televised. Thereafter, a series of national handball victories were secured by LAAC members: the open singles by Jimmy Jacobs in 1955-57; masters’ doubles by Alex Boisserie and Joe Shane in 1955-56, and then by George Brotemarkle and Bill Feivow in 1959. In the 60s and 70s, there was a shift in the demographic of players, attracting Hispanic immigrants in L.A., during which time came the rise of Naty Alvarado, arguably one of the best handball players of all-time. The first professional handball tour was held in 1973, and from the 70s to the early 90s, Alvarado won more pro handball tournaments than anyone and held 11 national single titles, a record he still holds today. The 1970s handball enjoyed a new generation of popularity, facilitated by the existence of a lot of courts. Elite clubs like LAAC, the New York Athletic Club, and the Manhattan Beach Athletic Club constructed four-wall courts for their members, and the public courts began appearing in places like the YMCA. Los Angeles fire stations also became an unlikely home to many courts; each generally constructed a fitness area for their staff, and for many stations, that meant a handball court. In turn firefighters have become a significant part of the Southern California handball community. Since the pinnacle of the sport’s popularity in those days, a number of factors have contributed to a lessening interest. Logistically, when racquetball lost some of its steam in the 80s, the demand for new courts fell. Many existing courts were torn down, leaving players with a lack of places to play. 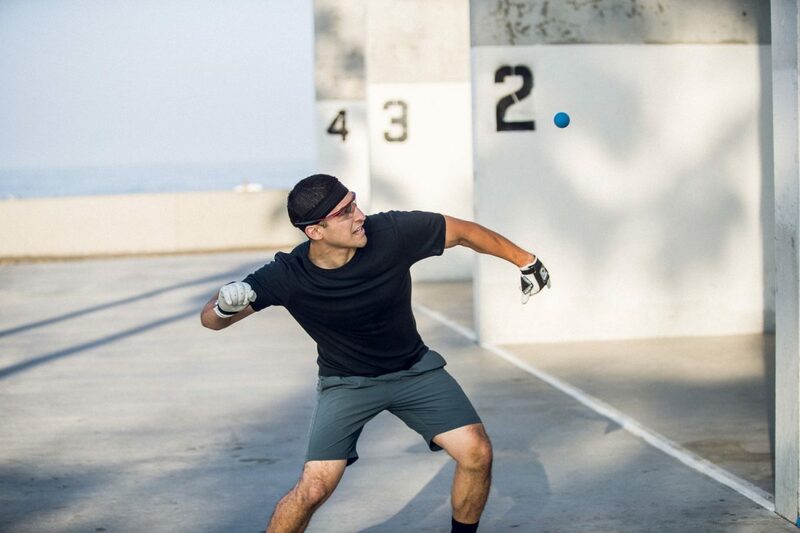 The now-defunct Southern California Handball League even suffered from notorious L.A. traffic as a factor in its decline, as players were forced to travel greater distances to the remaining facilities, and struggled to make time and connect with one another. Culturally, there’s been a general decline in the kind of streetside, pickup sports played by neighborhood kids so common in the mid-20th century, and Physical Education classes have also cut back on handball in order to focus on activities that engage a larger number of students. Handball is still offered as a club at many colleges, and a tournament is held annually. And of course, participation in any extracurricular activities can take a back seat to career and family in post-collegiate life, but proponents of the sport hope players develop a dedication to the sport during those years that will ensure their interest for life. That’s the thing about handball – it’s a lifetime sport. It can be played as kids on a makeshift court, perhaps be a competitive outlet during college years, and can be picked up later on as a break in the action of a hectic career, a chance to connect with family and friends. Handball is a simple game, but one with a long, complex history. For centuries, it has been a casual pastime or a competitive sport, an outlet and an opportunity to connect. Regardless of country or culture or era, it has always functioned to bring people together, across socioeconomic statuses and demographics that may otherwise not cross paths, a handball court has been a cornerstone of community, and continues to offer those same benefits to all who choose to engage.